Most organizations are ill-equipped to keep up with the changes and sophistication of cyber attacks. Security regulations grow more complex and demonstrating compliance demands increasing time and resources. Many Security Operation Centers (SOCs) solutions are commodity helpdesks tending to the basic mechanics of IT security systems. Most available SOC personnel available on the market are compliance-driven but lack real-world offensive or defensive experience. Many SOCs lack personnel with sufficient experience to deal with the daily threats faced by most businesses. The lack of professional expertise in the cybersecurity domain has become painfully clear by the inability of even large and well-resourced operations to recognize cyber breaches until weeks and months after the intrusion. Co-managed SIEM services enable security and risk management leaders to maximize value from SIEM and enhance security monitoring capabilities, while retaining control and flexibility. Keeping up with cyber threats and compliance requirements are tough tasks for any IT team, large or small. Every day you may experience a flood of alert warnings, emails, advisories, and threat data – plus you never have enough time, staff, or budget. PeriCertum offers a Co-Managed SIEM that functions as an extension of your team to strengthen defenses, respond in real-time, control costs, and optimize your teams’ abilities. Also known as SIEM-as-a-Service, our Co-Managed SIEM is built on an award-winning platform and has been on the Gartner Magic Quadrant for SIEM for eleven consecutive years. 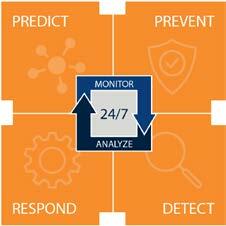 Whether on-premise or in the cloud, our 24/7 intelligence-driven ISO/IEC 27001-certified Security Operations Center (SOC) provides expertise so you can focus on the unique requirements of your organization. Is your organization at risk? We review billions of logs daily to keep customers safe. Check out some examples of what our SOC has caught. What might we catch in your environment? How experienced is your internal cyber team? Are they ready to protect your organizations’ assets? Have you ever had anyone try to hack your environment from both the outside and the inside (much more valuable and insightful than penetration testing)? Are you having trouble finding qualified cyber protection staff? Contact us today to learn how our Security Operations Center (SOC) as a Service can better protect your organization from today’s cyber challenges.